Dog Bites Man is a witty, tongue-in-cheek saga detailing the House-That-Jack-Built downfall of Eldon Hoagland, an innocent Columbia University professor who has become New York City's good-government mayor. The hilarious spiral begins when Hoagland, after an evening of drinking with his old Princeton roommate, staggers out of a Fifth Avenue apartment house, steps on a dog relieving itself alongside the mayor's car, and gets badly bitten. His cop-bodyguards shoot the dog and in the process terrorize Genc Serreqi -- an illegal Albanian stud who walks the dog (in addition to more intimate chores) for Sue Nation Brandberg, a former Native American beauty queen and socialite widow of a billionaire -- and he flees the scene. The mayor's bodyguards attempt to cover up their involvement in the shooting, but "Scoop" Rice, an eager young reporter for a muckraking Manhattan weekly, investigates and exposes the canine slaying. Then extreme animal activists, aided and abetted by every other interest group with a grievance against the mayor, tie up the city (not to mention air traffic around the world) in a monumental demonstration. Also offering encouragement are the rabid, newly amalgamated daily Post-News and the state's first woman governor, Randilynn "Randy Randy" Foote, who nurses an ancient grudge against the mayor and hastens his political demise. In Dog Bites Man, novelist James Duffy mixes it up in a lively tale of American politics in which rich movers and shakers, politically correct crusaders and scandal-hungry media types conspire to bring down a New York City mayor. All the hazards of American public life are on hilarious display here, in the freshest novel of manners and most outrageous political satire of the year. Mario Cuomo A really funny but not quite farcical political spoof. Lighthearted, breezy, easy to read, with a cast of engagingly familiar political types enmeshed in a nearly plausible political fiasco. 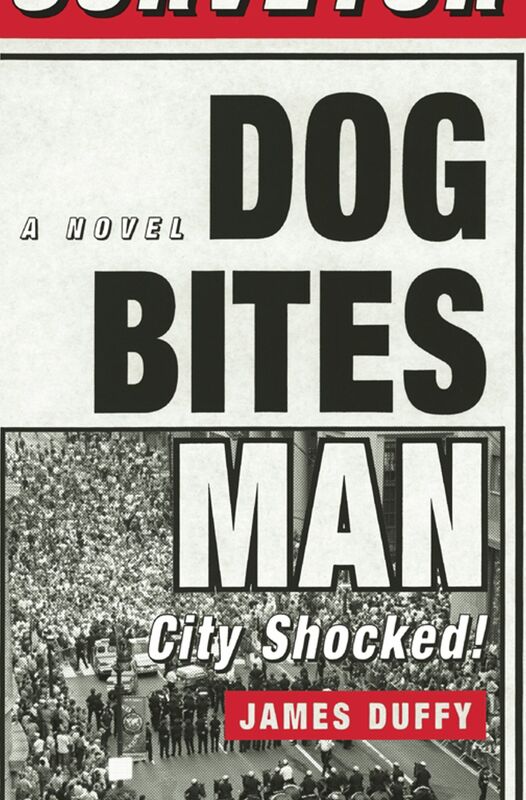 John Gregory Dunne In the circus of chicanery that is urban politics, James Duffy in Dog Bites Man: City Shocked! has found the perfect subject. Like P. T. Barnum, he orchestrates the entire thing -- from the animal cages to the magicians of deceit running the now-you-see-it-now-you-don't political three-card monte games on the runway to the high-wire acrobats offering a thrill a minute (over a net to save themselves) to the clown mental midgets pouring out of the toy car. Like the circus itself, Dog Bites Man is thoroughly entertaining and great fun. Terry Golway The New York Observer James Duffy spares nobody in this hilarious, Tom Wolfe-like satire of New York's power elite. Politicians, journalists, those ever-present 'activists' and the clergy scramble for power, headlines or cover -- all because of a dog bite. Absurd? Impossible? You won't think so once you've finished Dog Bites Man: City Shocked! James Duffy's novel is so good, it may even be true!